La Mesa City Council will once again this year host two Town Hall Meetings. The open-forum sessions provide an opportunity for citizens to share their concerns, ideas, and opinions on issues in their neighborhood and throughout the City. The first meeting will be held on Tuesday, Jan. 30, at La Mesa Arts Academy, 4200 Parks Avenue. The second meeting will be held on Tuesday, Feb. 6, at Northmont Elementary, 9405 Gregory Street. Both meetings will be held from 6:30 to 8:30 pm. The Town Hall Meetings are intended as a means for citizens to learn about city services, state what they like about La Mesa, how they envision the future of their city, and to express concerns. Members of the City Council and city staff will be present. Additionally, information will be available about crime prevention, emergency preparedness, and recreation classes. Further information about these meetings is available by calling the City Manager’s Office at 619-667-1105 or emailing lsimms@ci.la-mesa.ca.us. The San Diego Superior Court is seeing a record low submission rate for the 2018/2019 Grand Jury. The court typically has 15 residents per district. This year it is below that number. Currently, there is a need for more applicants from District 1 (South County) and District 5 (North County). Applications are available by telephone at 619-450-7272 or in person at the San Diego Superior Court in the Jury Services Office at the new Central Courthouse (Downtown) and the Jury Lounges at the North, South and East branches of the court. Applications may also be downloaded from sdcourts.ca.gov or the Grand Jury’s website at sdcounty.ca.gov/grandjury. The Grand Jury investigates citizen complaints and acts as a “watchdog” over government agencies. The County Grand Jury does not conduct criminal investigations. The 19-member body will work four days a week, approximately six hours a day, from July 1, 2018 through June 30, 2019 in Downtown San Diego. A small stipend per day, plus mileage, and Downtown parking are provided. All application forms must be received by Jan. 12. Candidates must be U.S. citizens; be at least 18 years old; have sufficient knowledge of the English language; and have lived in the county for one year prior to selection. All candidates will be required to pass a criminal background check. On Jan. 24, Sycuan Casino announced that the organization is looking to hire a new director of sales position. This position is the first of over 700 new jobs for the hotel and resort expansion project. The new positions will be in the hotel, food and beverage and casino divisions. Sycuan will begin hiring for departmental leadership positions during the first half of the year and will host a series of job fairs mid to late 2018. Last March, Sycuan broke ground on a $226 million hotel and resort expansion. The project includes a 12-story, 300-room hotel, restaurants, meeting and conference spaces, pool and gardens and a lazy river. The new hotel and resort is on schedule to open in early 2019. Details about job openings will be released as they become available on Sycuan’s website and social media pages. The La Mesa Chamber of Commerce recently announced the totals from their annual holiday drives — the Senior Project and the La Mesa Children’s Military Project. The Senior Project produced a total of 2,691 canned goods, toiletries, socks, and other items. The Chamber received over $2,130 in gift cards and cash donations from businesses and supporters which was included in senior gift baskets. These items, along with hot turkey meals, were transported to the Retired Senior Volunteer Patrol at the La Mesa Police Department. The La Mesa Children’s Military Project’s second-year event was committed to donating toys and items to children of military families living in La Mesa. 1,383 total toys, books and items were collected. Sponsors of the project included BJ’s Restaurant and Brewhouse, Barnes & Noble – Grossmont Center, Cali Comfort BBQ, Carl Burger Dodge Chrysler Jeep RAM World, EDCO, Fonseca Design Shop, Grossmont Center, Kappa Surveying & Engineering, Kirk Paving, Inc., Jerry Lester, Riviera Supper Club, Stoney’s Kids Legacy, The Regal Bar and Valley Farm Market. For more information on La Mesa Chamber of Commerce and its charities, visit lamesachamber.net. St. Martin of Tours Academy will host an open house on Feb. 1 at 6 p.m. in honor of National Catholic Schools Week. The open house will include students’ displays and opportunities to learn about faith development, classroom settings and community service projects. Staff will conduct tours and be on hand to accept applications for next school year. St. Martin of Tours Academy serves students from preschool to eighth grade. For more information, call 619-466-3241 or visit stmartinacademy.org. St. Martin of Tours Academy is located at 7708 El Cajon Blvd. in La Mesa. 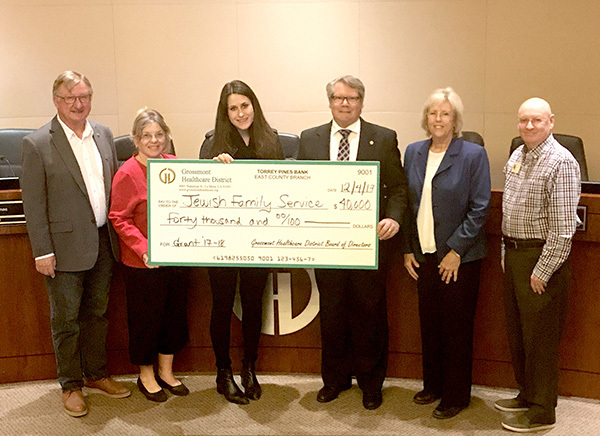 Jewish Family Services (JFS), Home of Guiding Hands (HGH) and nursing and medical tech students are all getting some additional grant funds from Grossmont Healthcare District (GHD). The GHD board recently approved a $40,000 grant that will help cover expenses for the JFS Foodmobile program that delivers nutritious meals to homebound seniors, and adults with disabilities who live in the GHD’s service district. JFS officials said the GHD grant will provide more than 11,000 meals over a year’s time. GHD has supported JFS with grants since 1998. The JFS Foodmobile program provides ongoing nutrition service to isolated, indigent, frail and vulnerable seniors and other homebound adults with disabilities who have no other access to basic nutrition. Gabi Charo, director of nutrition services, JFS, said home-delivered meals cost an average of $2,500 per individual for a full year. She said JFS provides more than 250,000 meals annually to San Diegans in need. GHD is also continuing its support of Home of Guiding Hands (HGH), an El Cajon-based nonprofit organization that provides services, training and advocacy to infants, adolescents and adults with developmental and intellectual disabilities. The GHD board recently approved a $69,000 grant that will help provide nursing care to HGH clients who live independently in their own homes, as well as about 150 residents of 31 HGH-operated community-based homes in El Cajon, Lakeside, San Carlos and Santee. GHD is also giving to students and is currently seeking applicants for two scholarship programs — one for nursing students and another for students pursuing careers as health technicians. The nursing scholarship, called the Richard J. Bea Nursing Scholarship, is named after former GHD board member Richard Bea, a registered nurse who worked at Grossmont Hospital for 18 years and served on the GHD board from 1996 until his death in 1999. There are two nursing scholarships available to local students studying to be a registered nurse; winners are eligible to receive up to $3,000. Students pursuing careers as health technicians are also invited to apply for one of five Health Tech Scholarships in the amount of $2,000. Eligible occupations include anesthesiology technician, cardiovascular technician, disability services management, laboratory technician, licensed vocational nurse, occupational therapy assistant, orthopedic technician, pharmacy technician, respiratory therapy technician, speech therapy or speech pathology technician and telemetry/EKG technician. Health tech scholarships are awarded based on merit of responses rather than a certain number of awards per occupation. Nola: Short for New Orleans, Louisiana, where the cub was rescued from. Missy: In honor of two women in Louisiana who played key roles in the cub’s rescue. Zoe: In honor of longtime LTB supporter, Zoe McCrea. Charlie: Suggested by generous LTB supporter, Sundi Yousko. 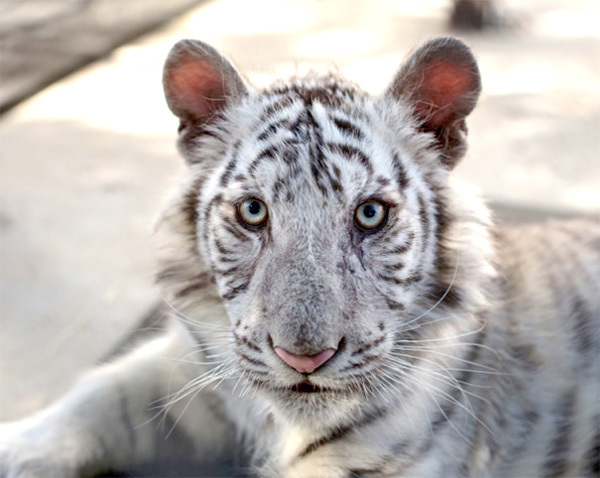 Sassy: Suggested by LTB volunteers, because of the cub’s playful, spunky nature. Make a donation of any amount to Lions Tigers & Bears to cast your vote. Each vote equals $1. Voters may donate online at bit.ly/2DrwakB with the cub’s name choice in the “Donation Note” field, by phone at 619-659-8078 or by mail. Send checks to LTB at 24402 Martin Way, Alpine CA 91901 with a note with the name choice. Donations for votes must be received by Feb. 13 at midnight. The winning name will be announced on Feb. 14. Lions Tigers & Bears is a nonprofit rescue facility dedicated for abused and abandoned exotic animals.